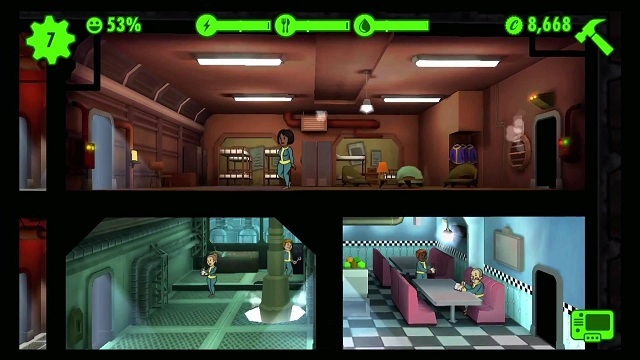 At Quakecon 2015 today, Bethesda announced the Android release date for their highly popular and addicting Vault simulator Fallout Shelter, which has enjoyed great success and accolades since it was released for iOS platforms on June 14th 2015 (the very same night they debuted the game during their amazing E3 presentation.) In Fallout Shelter, you play an Overseer (an administrator of sorts) of a brand new underground Vault (a bunker where humans have taken refuge from the nuclear devastation which has rendered the surface too dangerous to remain there) and it’s your job to assign tasks and choose how to allocate resources in order to achieve the best success for the people living there. iOS users have been enjoying the app for about a month and a half now, and in just a few more weeks Android owners will finally be able to get away from the irradiated wastelands and start working on making their Vault a place worth living in. But there’s more! In addition to the game launching on Android platforms, Fallout Shelter will have some features that are being added to both versions. Bethesda has decided to add a couple of new threats to the game to harass your Vault and its inhabitants in the form of well known series monsters mutant mole rats and deathclaws. While the mole rats never presented much of a problem in any iteration of the Fallout series, it’ll be nice to deal with something other than radroaches. And as for deathclaws, these horrifying creatures should pose a challenge and keep things interesting for any Overseer. Additionally, you will getting an assistant in the form of one of the hovering, multi appendaged spherical robots known as Mr. Handy. You can give your mechanical servant tasks to help you manage the Vault or send him into the wasteland to gather additional resources. Fallout 3 fans know that a Mr. Handy can be difficult to deal with so having one on your side is sure to be quite the blessing. Fallout Shelter is already available on iOS platforms and will launch for Android systems on August 13, 2015. The best part is that it’s totally free for anyone that wants to play!